great win...only wish Yao coulda got 40 so my fantasy team would have gone over the top tonight. Damn. Yaodizzle has taken Biendris and the Warriors to school. Bedrins got owned tonight. His worst performance over at least 10 games. He only had 6 points and 4 rebounds. Murphy hit a jumper from the free-throw line to end Golden State's three-minute scoring drought, but Yao answered with an easy baseline jumper. He got a standing ovation as Juwan Howard replaced him with 3:23 left in the quarter. Is it true? Standing ovation? Wow! Let's celebrate together with the Rockets Power Dancers !!! I appreciate the pictures of the Players, but DANG - can't get enough of the Power Dancers! Keep up the Good Work! Holy Crap! I'm gonna have dreams tonight and they won't be clean ones. Post game article from San Francisco Chronicle. 12-06) 04:00 PST Houston -- Unfortunately, Warriors coach Don Nelson had it pegged. In a pre-game chat about the different styles he and Rockets coach Jeff Van Gundy employ, Nelson described his former assistant as the ultimate stay-the-course guy, while Nelson was the mad adjuster. If something doesn't work, Nelson fixes it. And if that doesn't work, he fixes it again. And again and again and again. Nelson tried everything against Van Gundy's polished Rockets during Tuesday's 118-90 loss, and as the final score indicated, almost none of it worked. He tried to run the Rockets off the court by starting four guards, including the red-hot Anthony Roberson, along with Andris Biedrins, and watched the Warriors get pounded inside by Yao Ming. He tried playing Biedrins and Adonal Foyle at the same time. He tried man-to-man defense, then zone defense, then doubling down on Yao. All that did was cause Tracy McGrady to take over the game. McGrady finished with game-highs of 31 points and seven assists and Yao added 27 points, eight rebounds, and four assists to send Golden State scurrying home with its fourth straight loss. "They're good," Nelson said of the Rockets before tip-off. "They're not where (Van Gundy) wants them yet, I'm sure, but they're solid." In other words, they're everything Golden State isn't. Whatever goodwill the Warriors built up during their lengthy homestand has officially gone kaput in the past two days, lost somewhere along Interstate 10 that connects San Antonio and Houston. Golden State was blown out in back-to-back games and saw its record dip below .500 for the first time since Nov. 7. The Rockets are nothing if not formulaic. 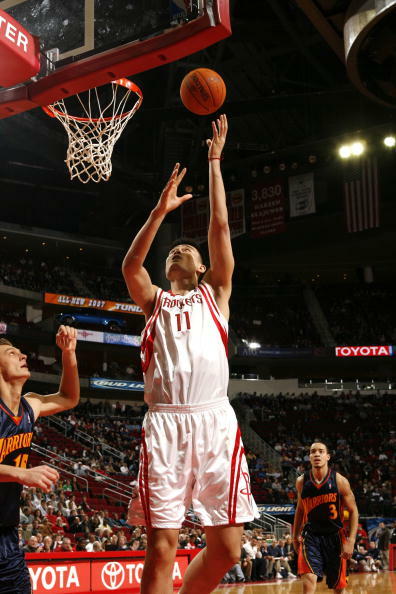 Yao has been their do-it-all this season, and he did it all against the Warriors in the first quarter. He scored the Rockets first 11 points on a pair of baby hooks and three straight layups and had 17 points by the end of the period. The Warriors left Biedrins alone on Yao, and Biedrins picked up two fouls in less than five minutes. By that time, the Warriors had been down 11-2, and they'd trail by as many as 20 points in the quarter and by 33 before the game mercifully ended. Golden State entered Tuesday's game as the highest-scoring (105.6 points per game) and fourth-best-shooting (46 percent) team in the league, but for the second straight game, never got their running game going. They showed signs of life only twice with mini-spurts going into and coming out of halftime. Baron Davis hit back-to-back three-pointers to cut Houston's lead to 65-44 at the end of the second quarter. Golden State then went back to man coverage in the third, sending a second defender at Yao, and forced a series of turnovers to close within 16 points. McGrady responded by attacking the rim, scoring 13 points in the quarter, highlighted by his one-handed windmill dunk over Biedrins, to break the game open. Monta Ellis led Golden State with 19 points, while Davis had 18 and Mickael Pietrus 12. They were the only double-digit scorers for the Warriors, who shot just 39 percent from the field and were outscored in the paint 62-26 and outrebounded 52-35. I don't know if anyone's already mentioned this, but during halftime, the Golden State announcers compiled a list of their top 10 Centers in NBA history. When asked what Bill Russell would have done to cover Yao, the Warriors analyst said "He would have needed help. There's no way, with Yao's size and skill, Russell could have guarded him alone."